Hi, all! I didn't have a chance to post it (it has been a busy year! ), but I had the honor of reading with the fabulous Lauren Groff, National Book Award finalist and author of Fates and Furies. I have been following Burrow Press for quite some time (since I was in Tampa). 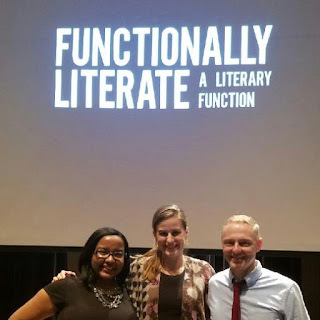 They host a quarterly(ish) reading series called Functionally Literate. When I finally moved back to my hometown of Orlando, I promptly looked up the next function and committed to going. It was also during the time I was starting Writer's Atelier. I was blown away by the event itself. It was so well organized, the readers were super talented, and people actually cared to show up to a reading. I thought about me publishing my own book and eventually being a reader for the series--but that was a long way off. One afternoon I got an email from the publisher, Ryan Rivas, asking if I wanted to be an opening reader for Lauren Groff. The Lauren Groff. It would be me and another ultra talented writer by the name of Hunter Choate who would open up for her. I read it over and over again, checking to make sure that it wasn't a mistake that he had sent it to me. I immediately responded that I would be thrilled to be a reader, even though reading in font of anyone terrifies the hell out of me, let alone reading with The Lauren Groff. At the time, the reading was four months away, and I spent a good deal of time agonizing over what I would read. I settled on a novel excerpt. I met Lauren the day of and she was so nice. We discussed writing and running a writing center. Once I got up on that stage, it felt good to be there. What a privilege. Overall, it was a pretty magical experience indeed. If you want to watch the clip of me reading, you can find it here.